Is as simple as nailing a 6 or 8 penny finishing nail to a wall and affixing a string to the nail with a weight at the bottom of the string. You need to drive the nail deeply enough to hold the weight of the weighted string and a dangling horseshoe, making sure you’ve left enough room between the wall and the head of the nail to allow a dangling horseshoe to find it’s alignment without touching the wall. The image below shows the string attached to the nail and the horseshoe hanging from it’s first chosen position. Note the clear packing tape from shank to shank. Please ignore shadows caused by the flash. I have deliberately chosen this horseshoe because I know that it is perfectly balanced. I have placed a notch on the inside of each shank, to define the halfway point from top to bottom. If the center of gravity is perfectly centered and is directly opposite the halfway point (as on this shoe), the shoe is perfectly balanced. NOTE: Most horseshoes are not perfectly balanced. Many horseshoes are tip heavy. This places the center of gravity closer to the tips. In 1998, Johnny Davenport filed a patent for his Mr. D shoes. 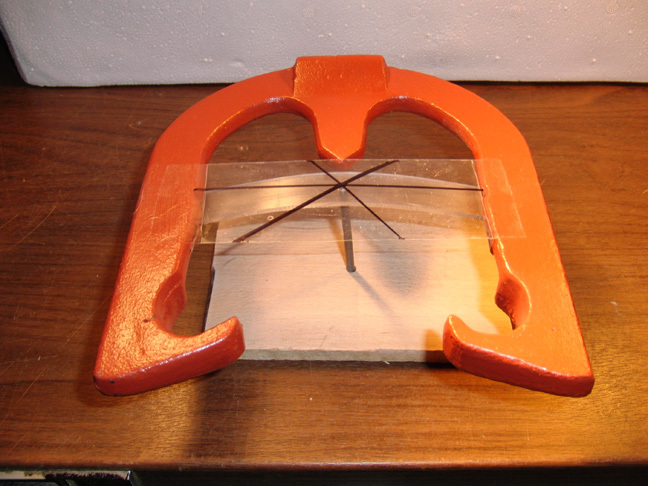 He recorded the center of gravity for 16 horseshoe models, none of which, had the center of gravity centered. Click on any image to provide a closer look. 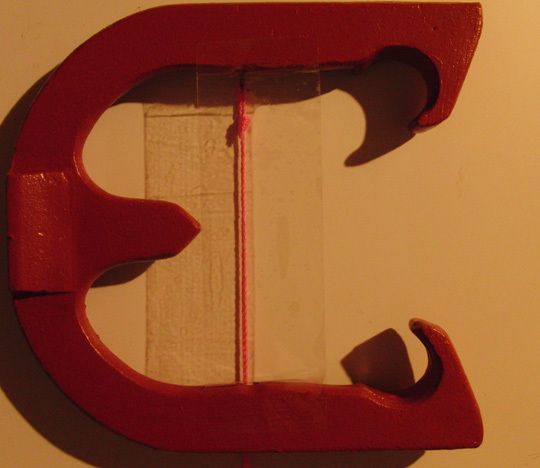 Position 1 showing tic mark over the string. Below is the third position chosen. The second position is already marked. Position 3 from randomly selected location marked. Position 5 with all points connected. To prove that the intersection point is the center of gravity, I have balanced the shoe on the tip of a nail. A weight as slight as a nickel placed anywhere on the perimeter of the shoe would upset the balance. A bit of mathematics is in order here. Horseshoes are generally cast or forged. Developing prototypes is much cheaper when cast from the original. All of my shoes are cast from ductile iron. The generally accepted measure of volume for ductile iron is .28 pounds per cubic inch. That means that in order to create a horseshoe that weighs 2 pounds 8 ounces, the total volume of the horseshoe must equal 8.9285714 cubic inches. In order to insure that your horseshoe is perfectly balanced I divide the horseshoe into 4 equal quadrants. Each quadrant has to occupy a volume of 2.2321428 cubic inches. NOTE: Information changed — I had to make a change in the calculation of weight based on a different volume requirement for ductile iron. When trying to calculate the volume requirement for 2 pounds 8 ounces I was given erroneous information indicating that ductile iron weighed .28 pounds per cubic inch. Actually, that was the weight for steel and not ductile iron. The actual weight per cubic inch of ductile iron is .245 pounds. I kept receiving prototype castings weighing 2 pounds 5 ounces. The new figure of .245 means I have 9.8 cubic inches of volume to work with. This permitted me to add addition design features in the final casting. The prototypes are now being received weighing in at 2 pounds 8 ounces. The image below shows how this assignment of volume is accomplished. This precision is virtually impossible with prototypes designed in wood. It is only when using 3D computer software that it is possible to make the very fine adjustments to equal this precision. It is very easy to add a little or take a little away. The image below is a representation of the design by quadrants. You will note that the left and right side are identical. Therefore, I only need to design one side. I only need to design the bottom half and the top half of one side. The bottom left occupies 2.2321428 cubic inches and the same for the top left. I join the two halves to form the left shank. I mirror the left shank to create the right shank and join these two halves. Voila! shoe done. Of course, it’s not quite that simple, but it describes the process. The only thing left is adding the company name “Hilfling” on the left calk and the unique name on the right. I print the output in a format acceptable by a 3D printer and the printer output goes directly to the foundry for casting. When I was deciding whether to go into production on the 4 prototypes I had initially designed, I had a number of NHPA pitchers test all 4 shoes. Without fail, every female pitcher preferred the FlipOn. Why? I asked. “It just feels perfect in my hand”, was the usual response. I wasn’t really certain why that was the case. It was not until sometime later, when I was checking the center of gravity that I realized that the FlipOn was almost perfectly balanced. I noticed that even though the shoe weighed 2 pounds 8 ounces, it felt light in my hands. With the introduction of 3D software I was able to concentrate on perfect balance. The horseshoe that you’ve been viewing on this page was the result. When I received it back from the foundry, I wanted to check the various flips and turns. The single flip worked perfectly. Very smooth, almost slow motion without any wobble or shank drop. I don’t throw a turn from 30 feet, but, thought I’d try the flip-turn. I took the 3/4 turn grip with my index finger in the shank notch. Perfect! A slight arm rotation and slight flip and a beautiful flip-turn. Finally, I tried the 1/3 turn holding the shoe at the right hook calk described in one of my earlier Parts. Again, perfect. The shoe flew flat and true without wobble. I was so excited about the results I’ve designed two additional shoes, both perfectly balanced, 3D printed and off to the foundry. The two on the way back are part of my “Tribute” shoes previously mentioned. Why is Perfect Balance Important? 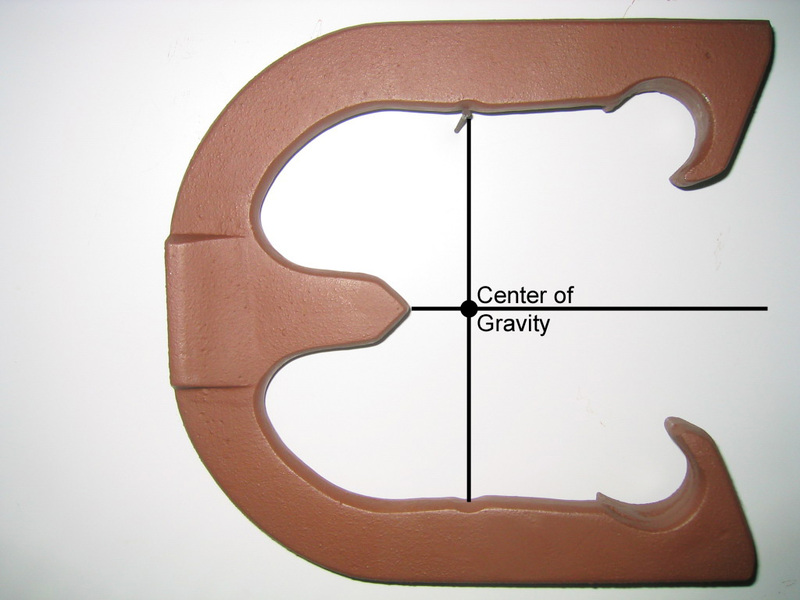 When the center of gravity is precisely centered, the shoe will rotate like a frisbee without any discernible wobble during rotation and the center of gravity will not deviate from its track to the target. 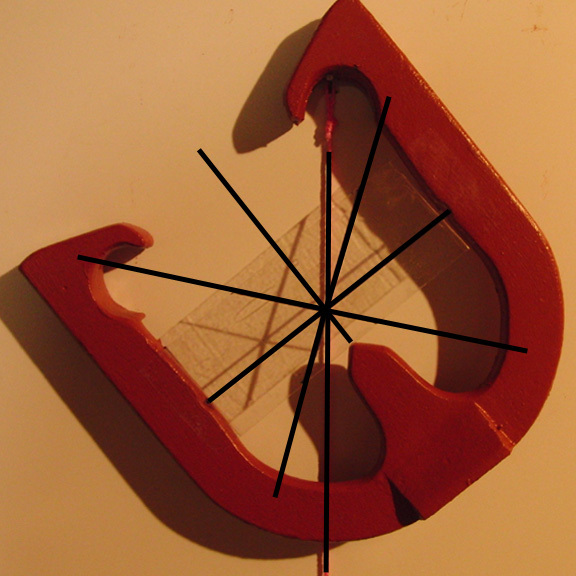 Placing a small weight on the outside of a frisbee would demonstrate visually the impact of an unbalanced object. A balanced flipping shoe would emulate a rod attached from one shank to the other and the shoe rotating around that rod. Again, the center of gravity would track perfectly to the target without deviation. The following is a list of the most obvious advantages of proper balance. 1. It provides a much smoother flip or turn. 2. It makes the shoe feel lighter. 3. It eliminates the shoe dip from centrifugal force on the forward swing caused by a weighted tip. 4. It eliminates the need to add additional flip effort. 5. It eliminates any unusual unbalanced rotation. 6. It eliminates any sloppy rotation due to heavy or light spots. Skip down to Moment of Inspiration, if you’re not interested in the search for 3D software. After the end of the pitching season in 2010, I continued with my search for a useful 3D software package. Most software companies offer a trial version of their software, usually 30 days. Some will fracture their software to reduce features. Typically they will eliminate the ability to save changes or will save in a proprietary format that is not useful outside of the software. Some vendors will give you their total package without reducing capabilities. Other vendors will give you a higher level version as a trial that provides features that don’t exist in their basic package. Make sure you know what version you are testing. I was looking specifically for software that helped design horseshoes that had to go through the foundry casting process. This meant the ability to provide “draft”. Draft is adding slight angle, usually 3 degrees, to every vertical face. The top half and bottom half have to be drafted in opposite directions to allow for casting in splits. This can be accomplished by chamfering or filleting an edge or the vertical face. 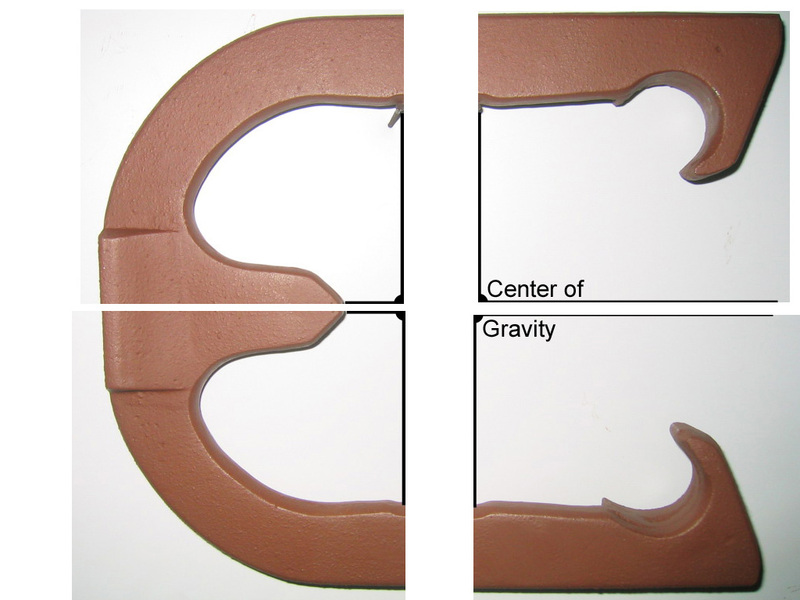 Without the ability to provide this simple concept through software, it must be added manually via sanding or routing. I tested at least 20 different 3D, CAD and CAD/CAM packages. The prices vary from free (SketchUp, Blender), low priced (TurboCad17, Milkshape), moderately priced (Rhino3D, T-Splines, Bonzai3D) and more expensive (Alibre, Inventor, SolidWorks, etc.). NOTE: this is not a complete list. I was able to find the most amazing 3D package that offered everything I needed to produce my horseshoes. It is called MOI (Moment of Inspiration). I downloaded their trial version and began to test the various requirements necessary for green sand casting. When I had a question I would post it on the MOI forum. Sometimes, within minutes I would get a response…a little tip or suggestion or solution to the problem. Many times it came from the developer of the software directly. When I ran out of time on the trial, I sent an email to MOI and was immediately granted an additional 30 days. A personal note: I developed software for 40 years starting in the mid 60’s. My goal was to make the interface as simple as possible and the front-end as intuitive as possible. This describes MOI. This is an incredible and inexpensive piece of software that provided all that I needed to design my latest line of horseshoes. It is simple to use, yet, extremely powerful in it’s capabilities. It also has a very active forum, ready to provide almost instantaneous response. The primary supplier of help comes directly from the developer. 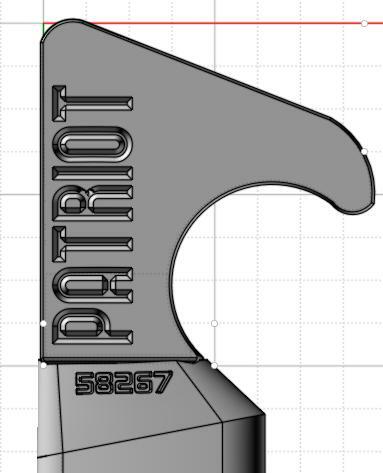 The output from this software is compatible with 3D printers, an absolute requirement for my design requirements. The URL for this website is http://www.moi3d.com/. I would encourage anyone interested in 3D, check out this website. I think you will be pleasantly surprised just how much capability is built into this software. An updated version with additional capabilities is presently under development. 3D Printing — is a relatively new process that allows 3D computer images to be “printed” out on special equipment, resulting in a true three dimensional part that you can hold in your hand. This is done by means of layering very thin slices of the image one on top of the other until the entire part is complete. Each slice is hardened as it’s laid, bonded to the slice below it, resulting in an exacting representation of the finished product. 3D printing equipment uses an array of substrate materials, mainly liquid resins or powders. In general, the cost is based on the type of material used, the resolution desired and the size/volume of the part. 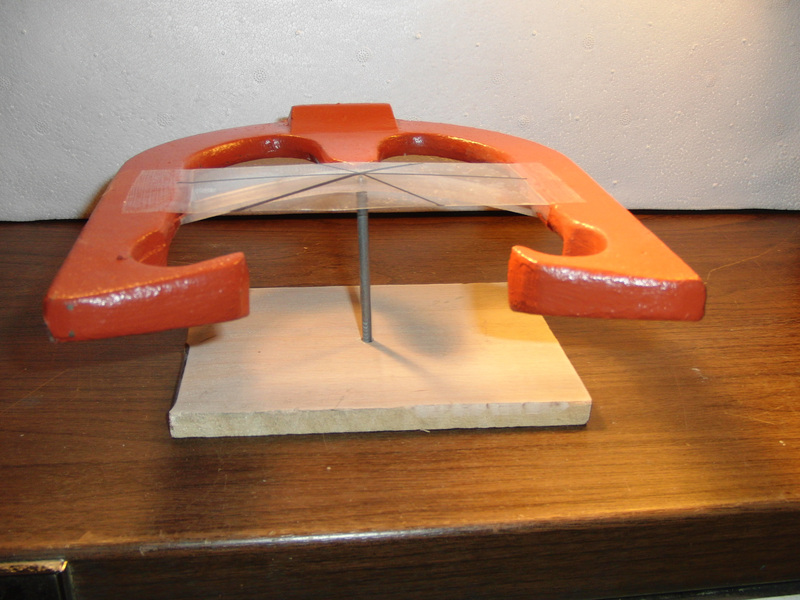 A horseshoe uses a lot of material, typically 9 cubic inches. Depending on the material and printer, a typical horseshoe can cost $200+ to have printed. A web search on “3D printing” (commonly known as SLA printing) will offer up significant information on service bureaus and processing equipment available. The common computer language extension for a printable file is a (.STL), producible by most of today’s 3D design software. Most service bureaus have online quotation services that allow you to upload your file for free pricing via the web. Shop around your local area for 3D printing, it’s worth the effort. 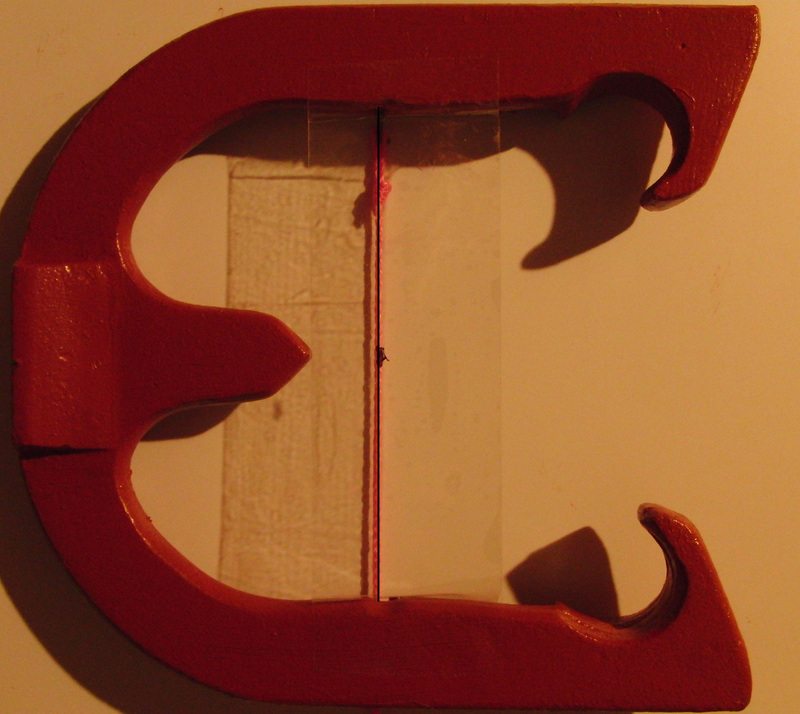 I was able to find a company that prints my horseshoes and hardens them with epoxy for an extremely reasonable rate. The name of the company is Wildwood Engineering Corp., located in Walkersville, Maryland. They are a full service, full complement design/engineering firm and can assist with the digital creation of your concepts if you do not have access to 3D design software. Their prices are much lower than all other service bureaus I received quotes from, and, are using the very economical yet exacting ZCorp 310Plus 3D printer. I am extremely excited about this new direction of design. With the help of MOI I am now designing a new series of horseshoes that I am referring to as my “Tribute” line of shoes. Each shoe will be dedicated to some military theme/service. My goal is to introduce a shoe that is perfectly balanced front to back and side to side. Every shoe will have a small notch on the inner perimeter of each shank to indicate the precise center of gravity. I’ve also decided to modify the inner and outer perimeter of each shoe and experiment with changing angles. I have sent out for 3D printing, two shoes that will go directly to the foundry for prototype casting. Using MOI I can now position the weighting in volume precise to within .0001 cubic inches. One shoe has the majority of weight on the outer perimeter and the second with the weight distributed around the inner perimeter. The possibilities are endless, as long as I keep the NHPA specifications in mind. I have always felt that you could design a horseshoe that reacted correctly for the type of swing or release of the individual pitcher. That would include slowing down or speeding up the rotation both vertically and horizontally. Early on I had a shoe modified to allow me to move the weight around the entire perimeter of the shoe. The first step was to develop a benchmark shoe that was perfectly balanced with the center of gravity directly in the center of the shoe from front to back and side to side. Below is the result of perfectly balancing the shoe. Note: I placed a notch on each side of the shank to indicate the midpoint. I always check how the shoe works with various flips, turns, grips, etc. I was pleasantly surprised that I was immediately able to throw a flip-turn. However, more importantly, the shoe flips perfectly. The benchmark shoe is shown below. If you select the photo below to enlarge it, you will notice a small nail positioned in the upper shank notch. Notice that the shoe is hanging in a perfect horizontal plain. This indicates perfect balance front to back. Using MOI I began to create a series of designs that looks a bit more traditional, but, has some unique features built in. The results have been amazing. 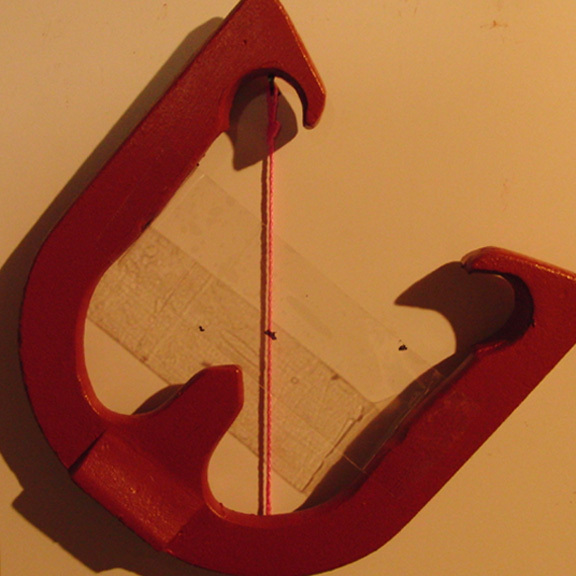 I no longer need to guess at the overall volume of a horseshoe as I did when designing the prototype in wood. I can now precisely add weight anywhere to alter the flight of the shoe. I want to honor the service of our fighting men and women, past and present. Each shoe will be unique and prototypes fully tested by a variety of professional pitchers. I will then decide which and how many should go on to production. The first thing to notice is that I have moved the shoe name to the hook calk. I wanted to leave each shank perfectly smooth so I’m moving any text off of either shank. The first prototype has the weight distributed around the inside perimeter. The second shoe has the weight distributed around the outside perimeter. The intent here is to offer a variety of gripping options for the pitcher using the 1/4, 1-1/4 or 1-3/4 turn. I will also be testing the weighting necessary to add a little wobble for the turner. Both shoes are perfectly balanced and marked with a small notch on the inside shank at the center of gravity. I am attaching a small sample of a portion of one of the shoes. Each shoe is going through the copyright process. What is the number “58267”? That’s the mystery question. E-mail me if you know the answer.